Dropping in to a crossfit class? We are honored to have drop-ins form all over the U.S. come through our doors every month! Whether you're passing through the Burlington, Elon, Graham, or Mebane area, dropping into our gym is a great way to stay on track with your fitness goals as you travel for work or vacation! 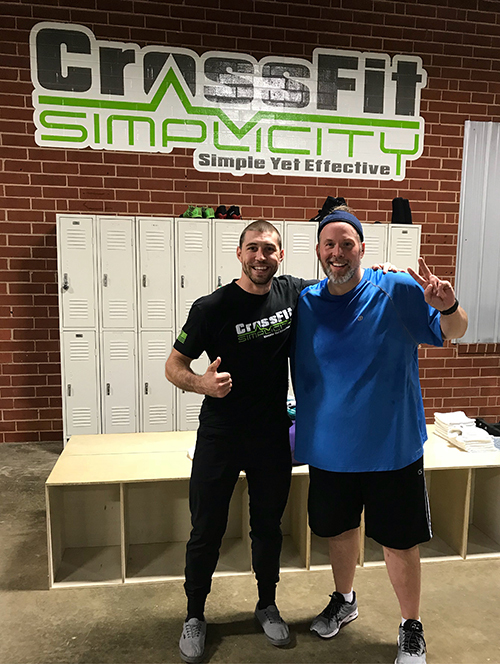 At CrossFit Simplicity we welcome drop-ins daily to all 7 of our classes! We’d love to give you the best hour of your day and have you as part of our community! Fees: $15 or the purchase of a T-Shirt! You may join us for a CrossFit class OR Open Gym to do your own programming. We have free bottled water, workout towels, and a fully stocked shower facility. We also have a beautiful and clean facility that is totally outfitted with Rogue Fitness equipment! Show up a few minutes early to sign a waiver and make your payment. We offer a discount for an extended stay or multiple drop-ins!